As always, the consistent performance of our Tier 1 languages – the top ten, more or less – is at once surprising and unsurprising. The relatively static nature of the top ten languages is interesting, certainly, in a technology landscape that is best characterized as heavily fragmented and growing more so at an accelerating rate. Conversely, however, it’s important to note that the numbers measured are accretive, and as with financial metrics, rates of growth are fastest when projects are new and harder and harder to come by over time. New language entrants are behind from the day they are released, in other words, which makes displacing the most popular languages a significant and uphill battle. In our Top Ten, then, with one exception which we’ll come to, there is little to note. Outside of the top tier, however, there are several changes worth discussing. Unusually, in fact, there’s something of a unifying theme to the various changes in this run: retrenchment. Kotlin (-1), Scala (2), Clojure (4), Groovy (2): In general, we caution readers not to assign too much weight to small changes in the rankings; the differences between one spot or another, in general, tend to be slight. This remains true as we look at the case of the JVM languages. It is interesting, however, that there is something of a pattern to the changes in this quarter’s run, however slight the changes may be. 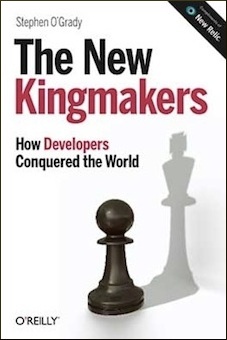 To refresh, the conventional wisdom around Kotlin has been that between its clean, modern design (one that inspired Swift) and its elevation to first class citizen status on Android that it’s the non-Java JVM language to beat. 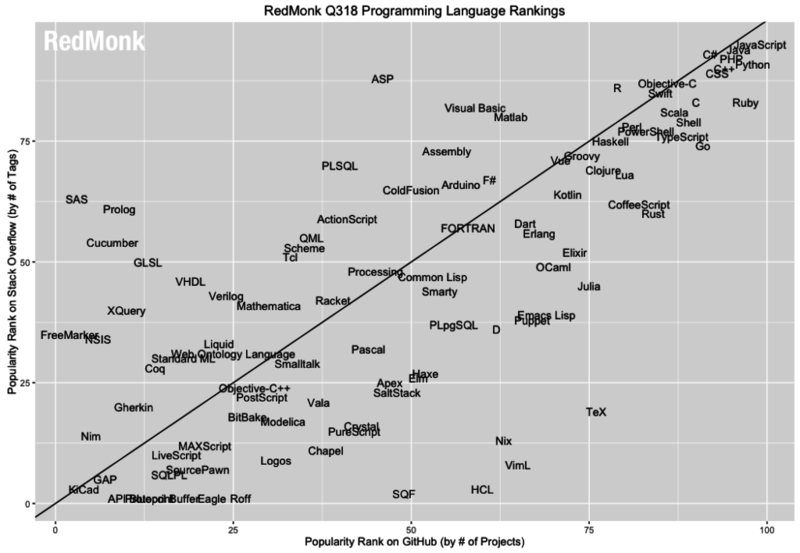 Its performance within these rankings has done little to discourage this notion; apart from Swift, it’s the fastest growing language we’ve seen. But for this quarter at least, Kotlin’s JVM based competitors managed to turn back the clock. Kotlin took a minor step back from 27th to 28th, while its JVM counterparts Scala (12), Clojure (21) and Groovy (21) all showed bounces – some significant. This was notable for Scala in particular, as it had dropped for three consecutive quarters entering this run. What this means for the future has yet to be determined, and Kotlin’s future remains bright, but its triumphant ascendance will have to wait for another quarter. Julia (3): A week or so ago, we received the following inquiry from a large vendor: “what are your thoughts on Julia – is it going to remain a niche language or grow or die?” The inquiry was interesting, both because of where it came from and because we haven’t had anybody ask about Julia in some time. While it’s been written up here before, it has tended to move very slowly and thus hasn’t attracted much attention. But the inquiry was well timed, because according to our rankings Julia is making slow but steady progress. This quarter Julia jumped three spots to 36, which is its fourth consecutive quarter of growth (36, 39, 40, 52). It’s certainly not on a Kotlin or Swift path, and the esoteric nature of the language may yet relegate it to niche status, but its steady performance has put it back on the map as one to watch. R (-2): R is essentially a case study at this point for why we recommend against over-reacting to any particular quarter’s performance. R has dropped two spots previously, only to bounce back a quarter or two later. Its domain specific nature means that it is never likely to compete for the very top spots on this ranking, but it remains dominant and broadly used within its area of expertise. Rust (0): Having jumped three spots in the last edition of these rankings and being the subject of much discussion in programming language communities, the question for Rust in Q3 was whether it could continue its upward trajectory into the Top 20. For the short term, at least, the answer is no, as the headwinds kept Rust at #23 for the second consecutive quarter. This quantitative stall is to some degree unsurprising, because growth becomes increasingly difficult the higher up a language ascends in the rankings. Anecdotally, however, Rust is popping up with increasing frequency, and long term it will be interesting to see what if any benefits it has from the language’s usage by open source projects originating in China such as PingCAP’s TiDB. Swift (-1), Objective C (+1): The only change within our Top 10 languages this quarter was Swift’s demotion from a tie with Objective C back to the 11th spot on our list. This has the consequence of boosting Objective C from a tie for 10th to outright 9th place. This may seem consequential, but the reality is that the difference in their collective rankings, while measurable, is slight. While it has yet to break in to the Top 10 and stay there, Swift’s adoption and usage remains robust. If or when it is ever established as a server side language as IBM and others have attempted to push at times, its ceiling is virtually unlimited. Go (2), TypeScript (-2): As with Kotlin, we’re regularly asked about TypeScript and its rapid growth. In keeping with the overall theme this quarter of retrenchment, however, TypeScript dropped for the first time in several quarters. It was a mere two spot slide, and the language remains enormously popular at 16th on our rankings, but it was notable nonetheless. After a one quarter single point drop, Go bounced back, essentially trading places with TypeScript at #14. While the languages are quite distinct in where and how they are used, it will be interesting to see how these languages perform relative to one another moving forward given that they seem to occupy relatively the same spots on the rankings with frequency. The original version of this chart had the axes reversed; this has been fixed and the image updated. Thanks to Edgar Arenas for the tip. Are the axes/labels mixed up? Edgar: well done for noticing that; the axes were indeed reversed. the image has been updated and re-uploaded. thanks for letting us know. Same with TeX, Mathematica, etc. The problem is that we cannot have a separate query process for a hundred different languages. The best we can do is the process used here, imperfect though it may be. I don’t see Ada in this chart. It obviously presents on github and stack overflow. so basically, the more people that have problems with a PL, the more popular it is here? rubbish…. One possible way to see trends might be to age the data from github and stack overflow. The more years since the last time a project or discussion has been update, the less value it receives in the ranking process. I know this is more work, but it would make the top 10 ranking more relevant.